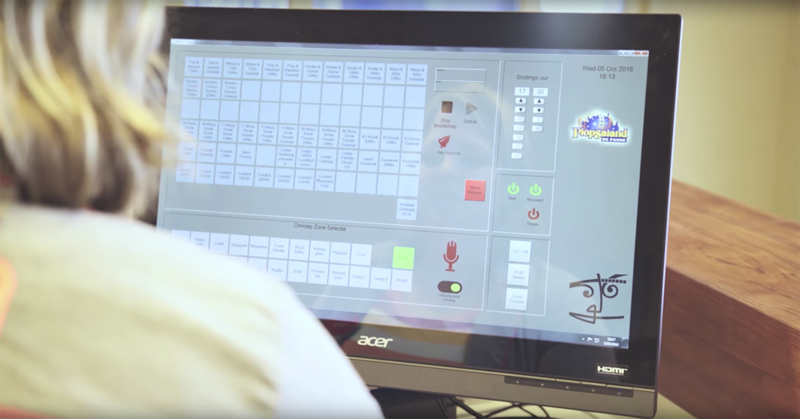 Besides theme parks, Studio 100 is making children television shows and owns a lot of characters like Plop, Samson, Wickie the Viking, Maya the bee… Plopsaland De Panne and Plopsaqua, which are located at Belgium’s sea side, got an audio-visual makeover provided by FACE. Plopsaland De Panne is more than 20 years old, first as Meli-Park and since 2000 as Plopsaland De Panne. Before the first technical operations, the park was equipped with some speakers and amplifiers in an analogue system. To turn the system on and off, a technician went around the park to check all attractions. There was a digital snake running through the park, but it was very limited. A few years ago, FACE installed the first Dante network. The complete existing network, the CobraNet system, is reused so there’s no need to do something completely new which makes there are no drop outs or difficult issues. Besides the CobraNet system, FACE placed some new Dante zones and placed both systems in a Media Matrix network to combine them. There’s now the possibility to make one big matrix and do something completely new with the renewed old zones and the new zones. FACE’s Project Division Manager, Steven Kemland, will focus on three zones in the park which are renewed with audio-visual products and techniques. The Prinsessia Castle consists of an indoor venue for events and includes a restaurant and an outside zone with terraces in two levels and an attraction. The attraction is the main happening of the Prinsessia Castle and triggers the sound to the other outside places. Inside, local input is needed to let a DJ or an orchestra play. A local Media Matrix Nion Processor over Dante is used, which is coupled to the general matrix and at the other side to the amplifiers. Previously, if we wanted 24-channels, we needed one or two big 40-unit amplifier racks which were producing a lot of heat. Now, there’s a good temperature so an air-conditioned room is unnecessary. There’s no need for a big room, a big rack or special place for the amplifiers. Another important issue is the power of the amplifier. You can’t run your AV equipment on the normal power of the attraction so a separate power line is necessary. In Wickieland, FACE build a very small rack with two Powersoft M50Q with DSP. One analogue signal will be sent out which will be split out to 8 channels so sub zones are created. All these sub zones have their own EQ, delay and level. When one of the zones is closed, all zones are all perfectly separately manageable. In most other and older zones, a small analogue mixer was used with a few amplifiers placed in a small rack and there was the possibility to do some level adjustments between outside and inside for example. For these kind of zones, FACE is installing a Powersoft Ottocanali with Dante and DSP built-in. The Ottocanali system will be placed in a rack and only one or two signals will come in over Dante. Plopsaqua is a recently build indoor swimming pool with capacity for 1000 people. One of the attractions is a big thundershow with rain, light effects, thunder… To simulate this real thunder experience, FACE placed 24 speakers to the ceiling. A big thunder show is programmed by TiMax with Dante output and placed on a PC with Dante. 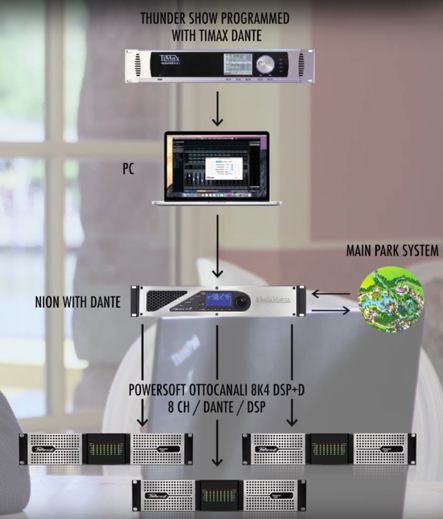 This PC plays the show over and over again and is directly passing the information to the Media Matrix Nion and to the Powersoft Ottocanali system. 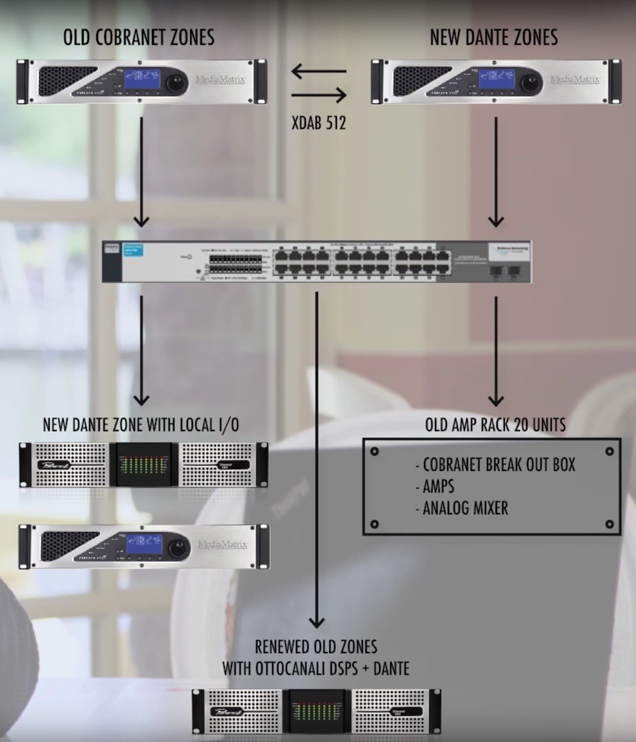 “Because of the Dante network, we can control the system from our offices in Boom. If there’s something wrong, like a speaker who isn’t connected anymore or an amplifier which lost power, it’s easy to fix out of our offices” says Steven. 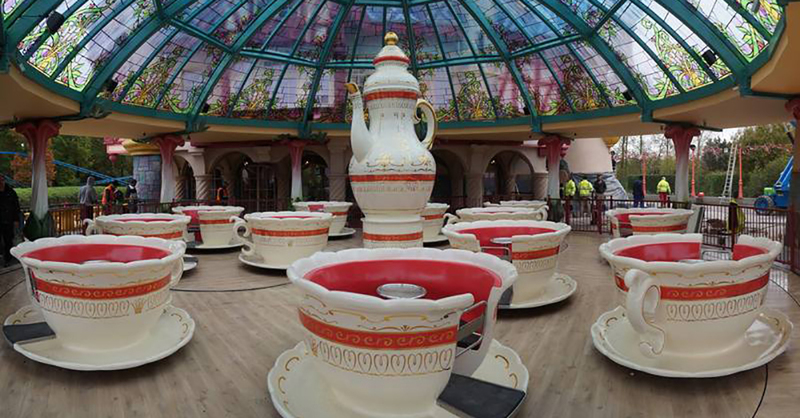 In Plopsaland De Panne there are over 30 zones, including Plopsaqua, Mayaland Indoor, the theatre and the Prinsessia Castle where local events are organised. All zones are controlled from the operator, who can monitor the sound in all different zones. There’s no need for a technician who is controlling and fixing the sound. FACE is doing a yearly maintenance and everything else is monitored from the FACE headquarters in Boom. All 7 theme parks (Holiday park Pfalz, PlopsaCoo, Plopsa Indoor hasselt, Plopsaland De panne, Maya land, Plopsa indoor Coevorden, Plopsa theater, Plopsaqua) are connected through the internet and the maintenance is covered by two people: one technician at FACE, who is controlling all technical issues and one operator at Plopsaland who is responsible for all messages and the music. How many low impedance and 100V lines are used in the system? It depends on the park, but around 80 or 90 % of all zones are using 100V speakers. With the Powersoft Ottocanali Series which we are using, it’s not important anymore. In the past you had to place a dedicated 100V amplifier, now you just select the cannels where the 100V speakers are on and that’s it. Like in the Prinsessia Castle, we have around 40 100V speakers outside and we have a few speakers and a small sub that are low impedance inside. We just select the channels and everything is manageable. What kind of speakers are you using in these theme parks? We like the Martin Audio CDD range because we can use them indoor and outdoor. They are standard IP54 approved and they exist from 5 to 12 inch. Though, the most important thing is that they have a differential dispersion technology. This means more consistent audience coverage than systems with fixed X° x Y° coverage patterns. A road in the park needed to be covered by a speaker system so music or speeches can be played. It’s only necessary to place one speaker every 12 meters and there will be a very equal sound when walking the road. If we’re talking about the aquapark, Plopsaqua, we’re using Renkus-Heinz speakers. They made a special version of their CF speaker, which I not only waterproof but also chlorine proof. Are you doing the design within your company yourself or are you using an external company? We do everything ourselves. I, Steven Kemland, have a meeting with the client, and we discuss the needs and how to make it happen. All this results in a general concept. After which our engineers, Stijn Vermeiren and Raphael Bollen start programming into the Media Matrix Nion and everything around it. Stijn makes very easy to use screens for the operator so we have a very user friendly environment. We use the Media Matrix Nion because it’s an open platform so we can write scripts and above all we use it for much more than only an audio matrix. It’s a control matrix for the complete audio system. Stijn is not your average technician. He not only implements our Project Team's plan, but draws most of them too. Besides being a true ninja with a screwdriver, he's also a seasoned programmer, and has been a key player in the development of some of our in-house developments.